I will try to make it a bit short post, cause I want to enjoy the fantastic weather today again. On wednesday Jan went out for a little trip on his "new"bike, to try it out and to slowly get the feeling back(well, better said, condition LOL) and I had the marvelous idea to phone my friend Heidi to check if she was home. And she was, for a while at least, so I went over there and we had finally a little chat again. It was about time, oh, time is going by so quickly, aweful! Then yesterday we went out again, on the bike, yeah! First I had to improvise for a little pillow at the back of it, to sit more comfortable(old bones, you know hahahaha). Then we made a tour through a park not too far away, and I even have a few pics made. After we biked through the parc and a bit further, Jan thought it was time for a little break. We found a nice spot, a bit in the shade and that gave me opportunity to make a picture of the bike and Jan. He may not look at his best(grin grin) but although he isn;t looking to happy, he was in a good mood,really! And here a picture of the view we had. That tree on the right is fantastic. You just see a part of it, but is was much more extended, Mother Nature has some wonders in her sleeves. Then we just road a bit to the left and the right and went home again, again through the park and I managed to make two pics, sitting at the back and Jan riding, Never thought they would turn out this nice. Oh, our very small pond in the garden has attrackted more animals. Jan wanted to clean it and add some fresh water and sound a tiny little nice looking salamander. I was really excited when he showed me the little creature. Now up to me to try to get a picture of it, if he's still there. Well, girls, I want to get dressed now and enjoy our lovely late summer, so I am sure I forgot something to tell, but hopefully I will remember it on Monday(will that be possibile???????ROFL!!). Here the second part of the "Altered Times"kit. Have all a fantastic weekend! Well, Monday we took a day of making a long walk! Sun was shining nicely, good temperature, so why not? We started our walk to a parc and little wood, where we thought there might be some blackberrie bushes. No luck, yes, the bushes where there(but not the bunch I wanted, but Jan said they were on the way we took and I was sure it was in a bit other direction LOL! ), but no blackberries. Some of them where still in bloom, so perhaps they will bare fruit a bt later and for the rest, almost no blackberries to find. Might be they already dried out or fell to the ground or they were picked by the birds. No big deal, we might try it another time. In stead there were LOADS of acorns ( and we saw some groups of schoolchildren having fun collecting them) and also pine cones, so I gathered a few, perhaps I can make a nice table decoration with them at Christmastime. We had a great walk through the woods and part of the dunes, all the way to Scheveningen, to the coast. By then the sky was covered with clouds again, which was a pity. So we didn;t go all the way to the beach, but walked a bit through the harbours and then I did feel a bit my legs, so we decided to take the tram and bus home again. By the time we arrived home, we had walked for about 2 1/2 to 3 hours! I didn;t take much pictures but I made one of a real nice car we saw, it could be a great car for us, except we don;t have a driver license and second, we don;t have the money for such a car LOL. But you always must dream a bit, and have fun speculating what you would do if you had such a car, hahaha. So I made a pic of it, with Jan standing beside it, like he is just inspecting HIS car, and looking satisfied with it. Then in the dunes I spotted amagpie, rather far away, but I tried anyway to make the pic. I don't have a very strong zoom on my little camera, but after cropping the pic, I thought the result wasn;t too bad. It was a nit exhausting walk, but I enjoyed it, especially when we were walking in the woods and dunes, it was so quiet there, and really refreshing. Yesterday I took it a little bit easy, as well as Jan, but I hope we will go this week again for a nice walk, weather is looking great, we really have a second summer at the moment. But in the afternoon Jan went to the "recycle shop"as we call them, to look again for a bike. And you can believe it or not, but I somehow had a feeling he would come back with one. And tadaaaaa, after a short time he came back home with a big grin on his face, inviting me to come to the hallway and there was standing a bike! Looked still really good, all necessary things were on the bike, he even was permitted to try it out in front of the shop(well, he had to leave his ID card, but I think that is normal), and was satisfied with his bike. And he did get it for a real small price, and even has a 3 month garantee on it. So in the late afternoon he right away took his old bike out of our little shed, took a few parts from it that were still okay and put them on the new bike and he is happy with it. So I quickly made a pic from him, working on his bike. The one in front is the old one, quite rusty and really ripe for retirement LOL. So you can say this were two good days. On to the freebie. I warn you in advance it will be in several downloads again. So it will take some days, with me only posting a few times a week, to have the kit complete. I hope you don;t mind too much. I always admired the altered art artists, being in digital or handcraft. I think, there are a lot of them who make really awesome things. And though I am not pretending I know a lot of the art, perhaps I just reach about 5% of it, I tried my hand on it, LOL. It isn;t as easy as you should think, not at all!! But it is great fun. 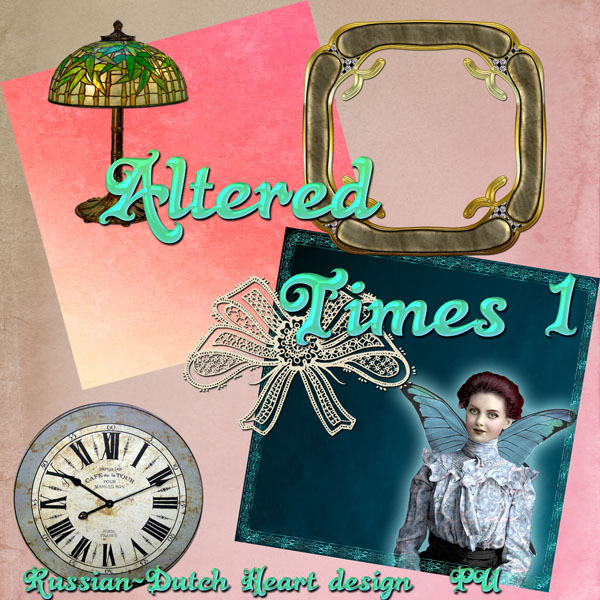 So here we go with "Altered Times"a 6 part download. Still I think there are some great layouts possible with the kit, once you have assembled all the parts of it. So let your creativity flow. See you again on Friday, and who knows, may be I will have a few more pics for, I promised some of the new clothes and of my maps for gardening, have to kick myslef in the ......... hmmmmm, you know, ........ to make them, but may be I will have some more pics of perhaps another walk. Till then, enjoy your day, try to stay optimistic, even if for the moment it isn;t going all as you should wish. Keep believing it will turn again to the good side, and one day it even happens. I know, easy to say, but we have to hold on to something to survive a bit nice, so without trying, you'll never know what might happen! We are having a bit summer again. This weekend the weather changed for better and it will stay like that the whlole week long, they say. It's really nice outside, temps around 70-75 F, and almost no wind, sunny, with a few little clouds. We should go out some times this week to take advantage of it. We had a nice, yet quiet weekend, not that I mind that. Oh yes, on Saturday I went out to get the newspaper and took a walk at the fair, as I was there anyway. They had the ususal stands, of course, but it was nice weather, great to be outside and take a look here and there. Hey, I didn;t buy ANYTHING at the fair. How great is that? LOL! 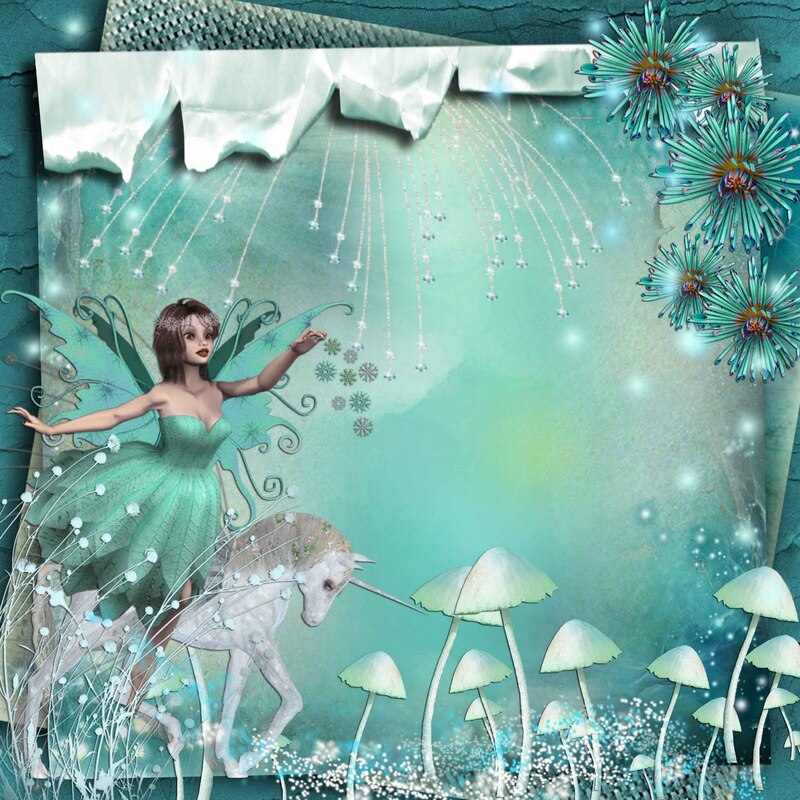 I just was at Valinda's blog http://vjscraproom.blogspot.com/, and was in awe of her organizing talent for her scrapbooking stuff! Take a look what she has done with her clear stamps! But it is really the way to do it, certainly when you have lots of stuff, otherwise it will be impossible almost to work with it. It's a bit the same I did with all the gardening stuff, gathered from the load of magazines I had lying around. I once spent days cutting all the things out that were interesting, then divided then in several themes and then made maps of it. I should do it again with the new magazines I have gathered again. Something for wintertime, I think. I am missing a bit the blogging and all from Minky. She seems to have trouble posting and adding pics and more. 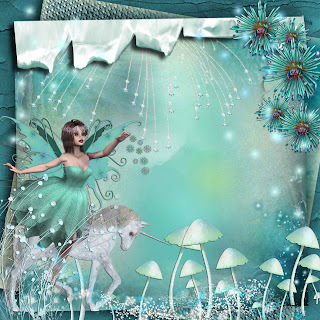 I couldn;t be of help to her, a friend of mine was so kind to take a look, but if anybody knows something about the inns and outs of Blogger, jump over to her blog, read what is the matter and perhaps she can be helped. Now I think I soon will get dressed, take a little breakfast sandwich and then go out for a little while. But first the freebie for you. It's a sweet kit that would be great for some baby pictures. It's named "Welcome to the World"
Well, the last two days we spent a lot of time watching the debat in parliament. Oh my, there were some akward moments as one of the members of the Chamber( and also partially from the government) left the ways of politeness.! I think it was too much. I don;t mind if they debat sharp with eachother, but there is still a way to do it properly. Well, it was interesting to listen to everybody, not that it will change a lot LOL! In between I did a few things around the house, went out for a bit of shopping too, so we are all settled for the weekend. Jan read in a neighbourhood paper, that there is another fair here in the shopping street close to us. As it seems that we will have real nice weather the next few days, may be we will take a look. Who knows, we even might finda shirt for Jan, hahahaha. Also started on a new kit, but there is still some work to do on it. 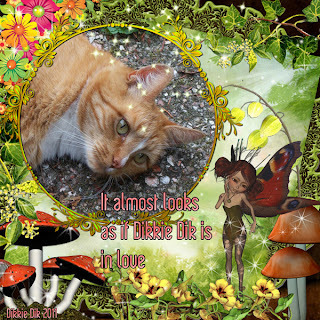 And talking about kits, we could jump to your freebie, as I don;t have much more to tell. 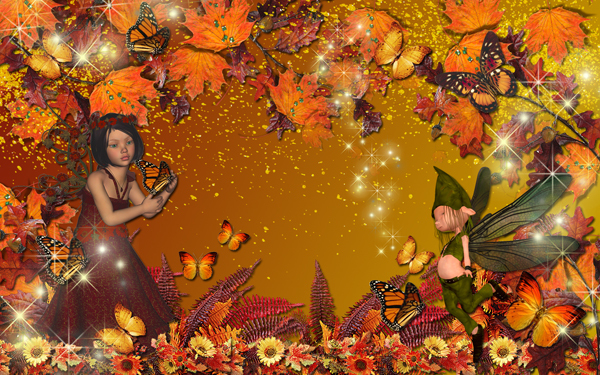 It's a fantasy kit, all about Autumn. Hope you can use it for something. Have a lovely weekend, till Monday! Okay, the "new parliament year"has started again. 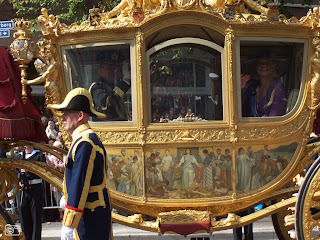 It was nice to see the Golden Coach and the Queen again, but the poor soul didn;t have a very optimistic speech(written by the members of the government) to give. It will be a difficult year for all of us, in short it will cost everybody money each month LOL! But I am afraid that the "average"citizen will still pay more then the ones who can miss the money, though the Minister of Finance wnats to let us believe, that isn;t the case, hahahaha! I liked very much the dress and hat of our Queen, it was very stylish. I didn;t see very much zoom shots of all the hats of the members of Parliament on tv, pity! Today in the Chamber of Parliament we call it Tweede Kamer, something like House of Commons I think) it will be a looong day. They will debat with the Ministers of Government about the plans they have to try to make the country "sound"again. Oh my, I wonder if it will change a lot, but it is always interesting and sometimes even funny, to watch and listen. It will be on tv all day long. So Jan and I will spend certainly some time in front of the tv. Monday afternoon I decided to go into town centre, and perhaps find me a few new sweaters for the winter. That wasn;t even so easy, the trend is sweaters with short sleeves, so you always have to wear something under it with long sleeves. Very nice sweaters, indeed, but I like to have warm sweaters with long sleeves LOL! And of course I don;t like to pay a huge price for a sweater, like around € 40,00 or € 50,00, I am not nuts! I cannot afoord it either. But finally I found myself a nice pair of dark grey jeans, a nice sweater you can wear under a lot of different sweaters and a real nice cardigan, also in a greyish colour. I will try to make a picture of them to show you on Friday. Oh, something miraculous happened. Jan asked me to look for a shirt for him!!!! He wanted to have a dark blue one and perhaps a light lilac one. Worst was, I couldn;t find them, Well, there were just a few available, but they were real expensive, so I didn;t buy them. Not to worry, sooner or later I will find some nice ones. Now I will have to go through my closet and clear it out. I still have colthes there, I actually don;t wear, but somehow cannot throw away yet. Stupid, of course, but looking at them the thought comes into my mind: "Perhaps in some time I will wear them again(as trends always come back again)". Do you know that feeling????? 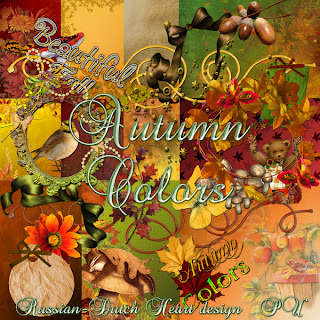 Done with my "Autumn Colors"kit. 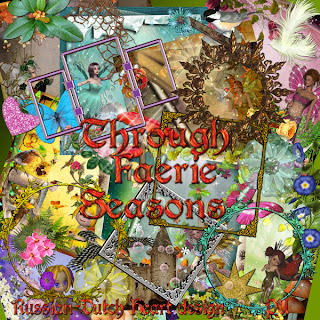 'Done with "Through Faeries Seasons"
Okay girls, I have for you the last part of the "Whispering"kit and a little extra, if you want it. I just was a bit playing around in PSE8 and made a desktop wallpaper, I have it on my computer now too(I like to change it from time to time) and I must say, it looks rather pretty. Have a fantastic day, and till Friday! After a really relaxing weekend on to a new week of who knows what! Friday we went looking for the bike Jan saw, but it was gone already! So I told him once again that if he sees another bike again that looks okay, he should buy it immediately if the price is nice for a second hand one. Or at least leave a little deposit and come home to fetch me if he wants. So till now no bike for him. Instead we did buy something else for just a few euro's, and you will grin when I tell you what.! We bought us 4 pots for our indoor plants, LOL! Jan wanted to repot a couple of the plants, they really needed a size bigger pot, but we didn;t have any pots of pottery anymore. And as it was nice weather on Saturday, Jan repotted most of the plants, and did that in the garden, much easier and the mess of it is easier to clean away. In the meantime I did some pruning of the lavender and removed some weeds and "old"plants. Still have to do some more, but a start has been made. 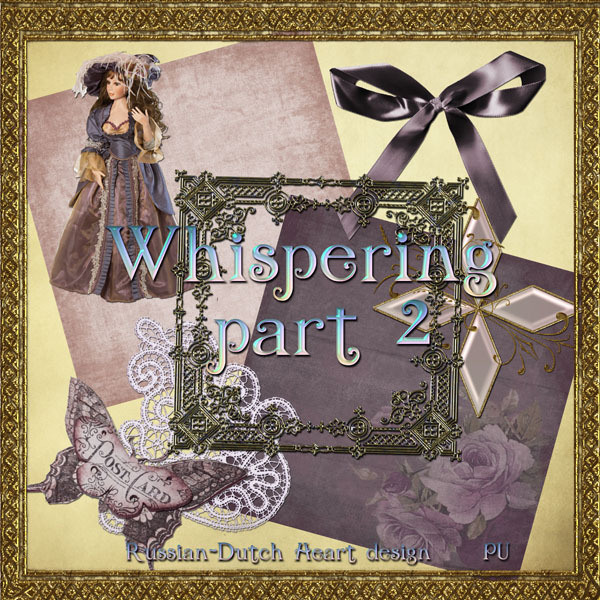 I also was rather productive on the designing side, only I have a bit of trouble in uploading the kits on Mediafire. The uploading speed is SOOOOOOOOOO low, unbelievable! Don;t know if it is something from my internet connection or that it has to do with Mediafire. I will try it again today and hope that it will speed up a bit. Very annoying when it takes a real long time to upload a kit! 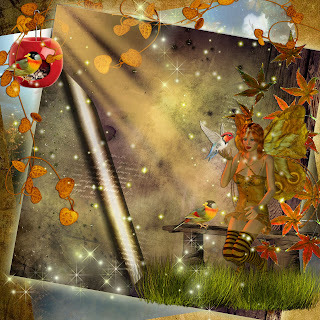 Oh, this morning I found a nice message in my mail, from Nanette of Scrap-4-Kids blogspot. She made a layout with papers from another designer but the frames she used where from a kit of mine! And she got it published in a magazine, I will give you the link to Nanette's blog to see her layout and also the link to the site of the magazine, Enchanting Creations. I went looking to that site and must admit that it is an awesome magazine for scrappers of all kind! 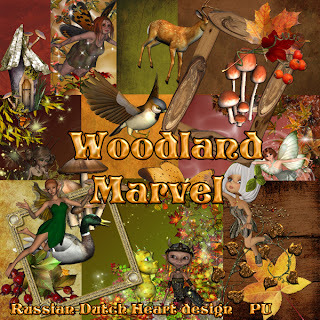 They also have a forum and much more and every month some themes to make layouts with and if you do it well enough they publish it! Tomorrow we will spend some time in front of the tv, during the day, watching the opening of the year of parliament. 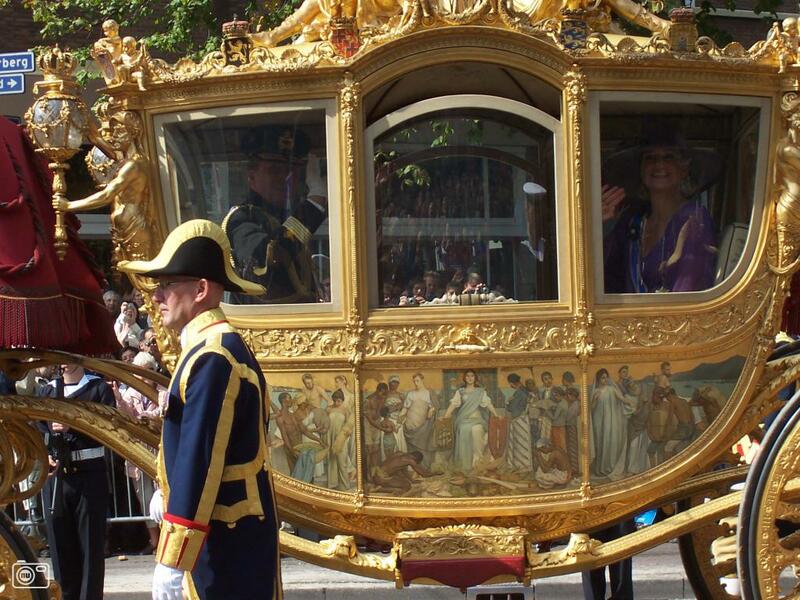 The queen will arrive in the centre of The Hague, at the Ridderzaal to have her speech, and she will ride in the Golden Coach. That always is nice to see. What I always like to see is how the Queen and also Princess Maxima( wife of Willem-Alexander, oldest son of Queen Beatrix and successor of the throne) are drssed. And very amusing to see are the different hats the ladies of the parliament, or wife of members of parliament and guests are wearing! It's rwally a hat-parade. Some of the hats are really nice, but some of them have a really weird thing on their head LOL! 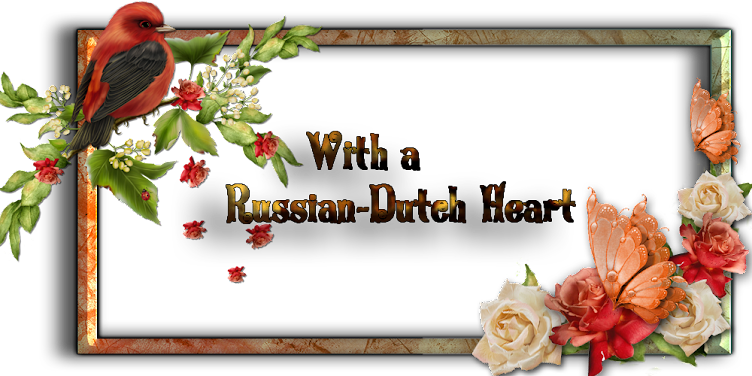 And if you like to see the Gouden Koets and the ride with all the entourage there are enough videos to see on youtube. Time for me to finish this post again, with another part of the Whispering kit. Yet one more to go to have it all complete, last part will be posted on Wednesday. I had a terrific good night of sleep, and I can feel that too. After months of broken up nights, it now happens a lot more I can sleep 6 or 7 hours in a row again! And if I wake up at night(sometimes natures just calls to me, ROFL) it can get back to sleep much sooner than before. Hoorray for that. My talk about Jan, finally buying some colthes again got a lot of comments, hahahaha. It seems a world-wide spread virus, isn;t it ladies?? Wednesday afternoon we went for a walk to the market, where I just bought me a new pile of potatoes and onions and yeas, also the wundaweb for shortening the trousers(thanks Chris, for telling me the English word!). We also did pass several stands with nice jeans, but no, I didn't succeed in letting Jan buy a pair of them! So I suppose his short-time madness was already gone again, LOL! It was another rather fine day, so it was good to be outside for a while. Yesterday I did most of the shopping for the weekend already and after return, I kicked myself in the bottom and did the job on Jan's trousers. I did them all, oh my, what a good girl I am at times. Happy that it's done, and what a wonderful stuff that wundawebb is!!! Then I prepared the dinner, which was really yummie. Made chicken filet filles with salami and mozarella, self made french fries and some butter-beans. Some strawberries for desert, and voila, our stomachs were loaded again. In between some quick hoovering, and usual cleaning up, so I am rather satisfied with myself, grin grin. 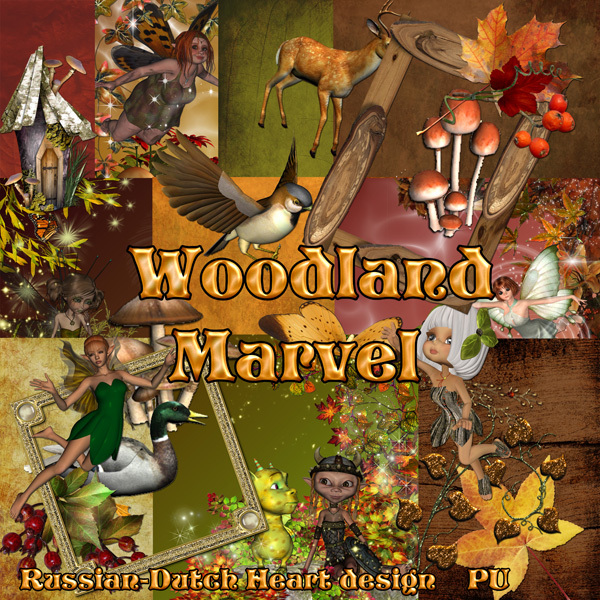 And I even had a bit of time designing on a new kit, almost ready with that, just have to upload the files. 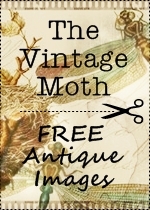 Oh, I might have a nice link for you I found, when I was looking around on internet for something, it's a Flickr account, where you can find a lots of beautiful textures and also pre-made backgrounds, most of them Creative Commons. Worthwhile to take a look at Brenda Starr's photostream. 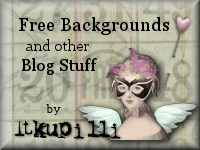 Last but not least, try this one, with LOTS of links to other sites, and the bst is, that they are almost all free to use, so be sure to check the TOU of the one who offers those wonderful things! Ha, I think I gave you enough to spend some time on the internet in the weekend! Oh, if you download something from one of the sites, don;t forget a little thank you. It always makes people happy, is just a small gesture with great effect! Today Jan wants to go for a bike search, but he wants to find a good second hand one, and there are lots to find, if you take a bit of time. It saves you really a lot of money, so if you don;t need one right away it is a good thing to do it this way. And though the weather is colling down a bit, it still ca be nice outside, specially when the sun is shining. So perhaps Jan and I will do our best this weekend to make a start with the winter-preparing of the garden. We'll see if that will actually happen. Tomorrow I just will have to buy us some fresh bread and the weekend newspaper, and may be I will do some ironing, not sure about that yet, hahahaha. Both of my cats come in the house a little bit more often, at the moment they are both lying asleep on the couch, like two furry balls, leaving almost no space for someone to sit. And they are acting very cross when you try to move them aside a bit, so that with some effort you just can squeeze yourself on a small spot! 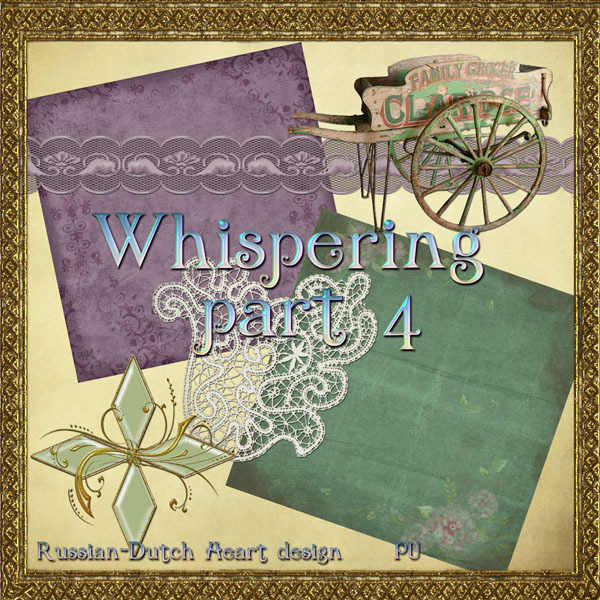 Well, that's about it again, so I will give you the 3rd download of the Whispering-kit. My hubbie will look smart LOL! Already for some time Jan wanted and needed a few new trousers. And then yesterday morning the aweful event took place, he had to throw away one of his favourite ones. Yes, part of the cloth was sooooo thin, that he could actually put his finger through it. So he finally decided he should have some new trousers. And the more extraordinary it was, because he allowed (yes, ROFL) me to go with him to town centre. He hates normally to buy clothes, especially when it is needed to try them on in the shop. But arrived at the store he took a good look around, chose several models and tried them on. At the end he ended up with 3 pair of trousers. But if you know me, I always look around some more, the more because it is VERY difficult to get Jan into town for buying new clothes, sigh! trousers and so my hubbie will look smart this autumn and winter. Today we will have to go to the market, potatoes are needed and some veggies and I will have to buy the stuff I can use to shorten his trousers a bit. Don't know how you call it, but it looks like a thin band of fleece, that you can put at the cloth, take a moisty textile, like a handkerchief or so, and then iron it and voila.... it glues the hem, nice and easy. I probably give it a few stiches too at the sides, for extra security. As I have no sewing machine, it's the quickest way to shorten his trousers, otherwise I will have to stich it by hand. And may be, just MAY be, Jan will look for a pair of new jeans at the market, he could use aother pair and then he will be all ready for the next season. It was real pleasant weather yesterday afternoon, so returned from the town, Jan went for a moment into the garden, with his crosswords, but also made his little tour through the garden and came to me full of enthousiasm, to tell about his find there. It seems that our toads had a busy summer, LOL, because under a little tile he found a whole bunch of eggs. So if all goes well, next spring we will have some new born toads hopping around again. You can find the wonders of nature sometimes in your own garden. Hmmmmm, time now to get me another cup of coffee, just a little bit of playing time with my PSE an then get ready for the market. Let's see if there are any miracles left for today, like Jan finding and buying his pair of jeans, hahaha! If so, I know that for the next year at least I shouldn't mention anything to him about buying perhaps a new shirt, or sweater, but let's be happy with yesterday and perhaps even today ROFL! 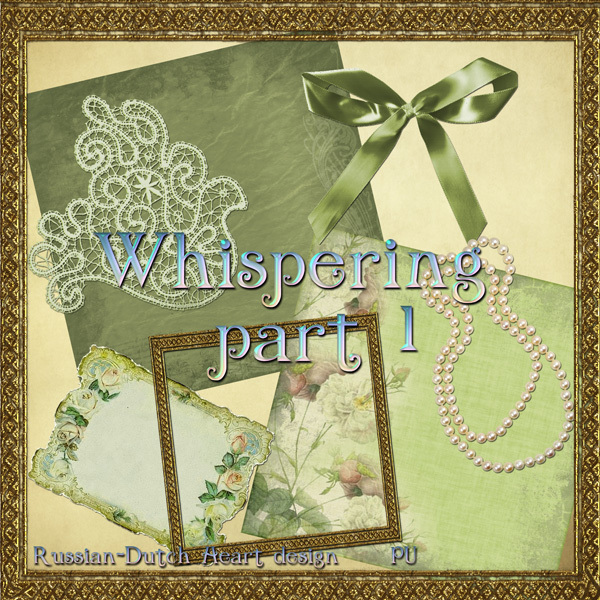 I have today the second download of the kit "Whispering". On Friday I did make it to the supermarketas I planned. At first weather was nice, but on the way home it was rather warm(not the part that I mind too much) but with a lot of moist in the air. And that is not the best weather condition for me. But... after a little rest with a sandwich and a cup of coffee I was allright again and did some housework too, plus a landry. Saturday I just had to buy us the weekend newspaper, weather okay, less moist,a bit cloudy, a bit sunny, but then in the evening a lot of pictures were taken of us again LOL. Thunder and lightning and some sudden serious rain. Still it was nothing compaired to other parts of Holland , what I;ve seen on the news. WOW, that lightning was really impressive at some places! 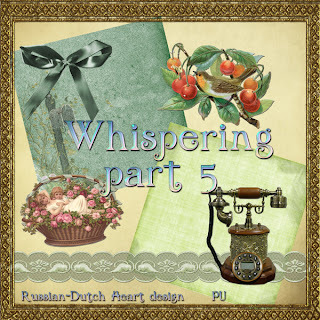 Yesterday we stayed at home, nice and calm, I could do a lot of desiging, while Jan was reading his newspaper. Seems a boring weekend, hey? Well, that may be so, but I enjoyed it, grin grin! I will show you something I received in my mailbox. 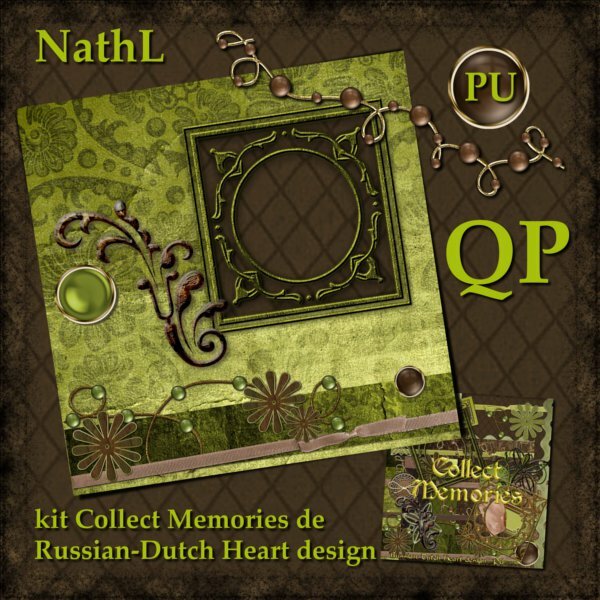 It's a quickpage from my kit Collect memories, made by Nathalie, to be found on this link, where you can download the quickpage. I think she did a really nice job! 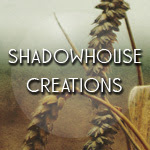 Go pay her a visit, she just started with her blog and some encouragement will do her good!! I am hoping that soon the wind will ease down a bit, because there has to be done a bit of work in the garden, I don't mind so much if it's a lower temperature, but working with a hard wind isn't very practical. I have to do some pruning this month, e.g. the lavender has to be cut down a bit to ensure we have lots of flowers on them again next year. Also have to get some weeds out of the ground , well in short preparing the garden slowly for autumn and winter time. May be I can get Jan also to it, he could do some pruning with the BIG scissors, needed for the ivy. That is lovely, but grows much too fast! Okay, we are heading towards the freebie. 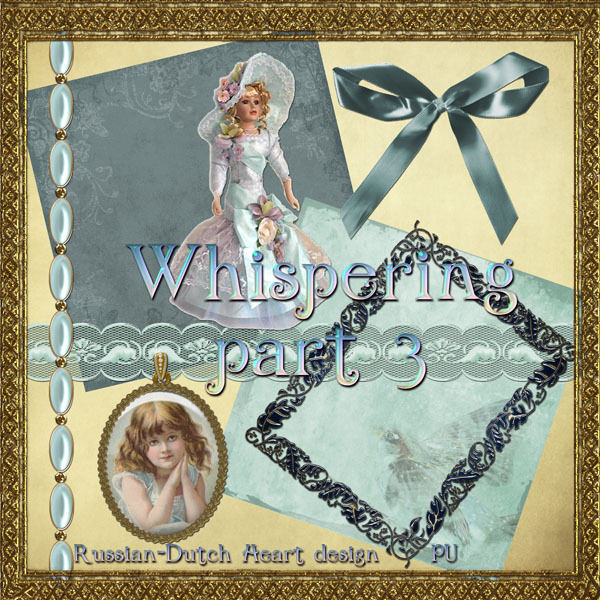 It is a 5 part download, so you will have to come back a couple of times, to get the whole kit, well, if you like it, of course. It's a vintage looking one, named it "Whispering". Have a great day, allow yourself to smile a bit, it makes one feel a lot better. I just come from reading the blogpost of my friend Edna, leaving it with a smile on my face! And why? Because she can write with such humor about in fact ordinairy things of every day. This time about the weather forcast, predicting just some light rain, in fact being a real waterballet for Edna LOL! Her weatherman isn't the only one who sometimes says funny things. It happens all over the world I believe. And yes, I know and realize they cannot influence the weather, and have to make an average for the whole country(well in Holland they can, cause it is just so small), and still they are at time completely wrong! And what to say about their joy glancing on their faces, when they give us the forecast for the next two or three days! Specially when it is bad weather! Our weatherman on one of the channels, can predict the worst possible weather with still a BIG smile on his face, just saying: "yes, I know, it will not be nice weather, but how beautiful are the rain and thunderclouds, and let's be honest, it fits Holland, and if you live at the coast, go to the seaside and admire the HUGE waves because of the sotrmy wind, just like a painting from and old Dutch painter, isn;t that great???" Imagine, me, dwarf Kyra, height 1.53 mtr, weight around 38 kg., going for pleasure to the beach to watch the HUGE waves in the stormy wind!!! They better send somepeople with me with large nets to catch me in time, if I an blown away! ROFL! But today it could be not too bad weather, though it is raining a bit at the moment. But every now and then there should be some dry moments, with a bit of luck even with some sunshine( cross your fingers! LOL). So I want to do some shopping today, cat food running out again, bread, some sausage for on the bread, the usual things and also want to to some dusting and vacuumcleaning around the house. And when that is all done, I want to get back working on a new started kit. Or actually, on TWO new started kits LOL! That often happens to me, working on two different things. Well, if inspiration for one is a bit lacking some moment, most of the time it goes well again on the other. And in between I am working on four cards for Minky's blog too. Have to make just one more and then I can zip them. 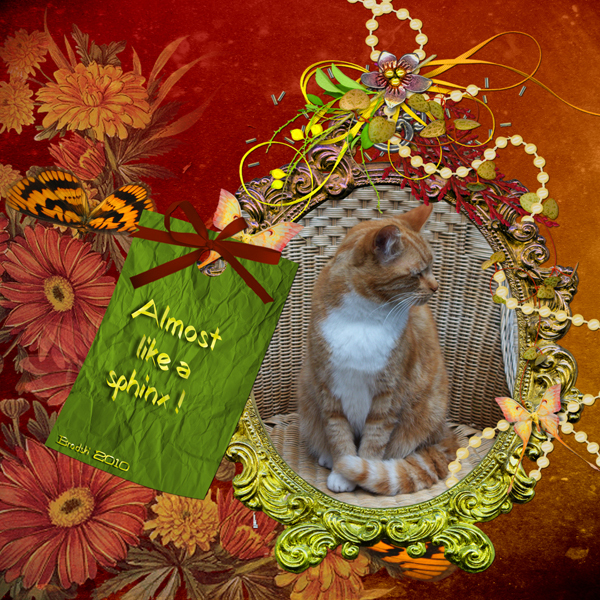 Today I have a kit, that probably my friend Edna will like a bit, she likes the colors in it, I know. And as we are heading for autumn, this is a real Autumn kit( in this part of the world it will be Autumn, grin grin). 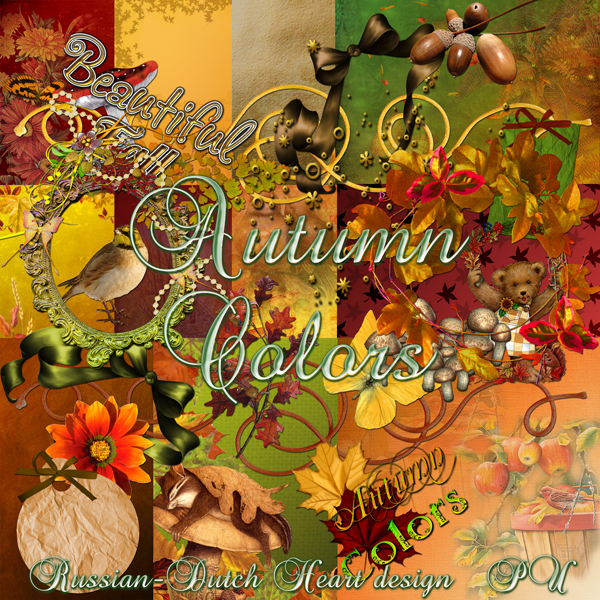 A simple name: "Autumn Colors". Have a wonderful weekend, and see you on Monday again! Lazy days are great at times! 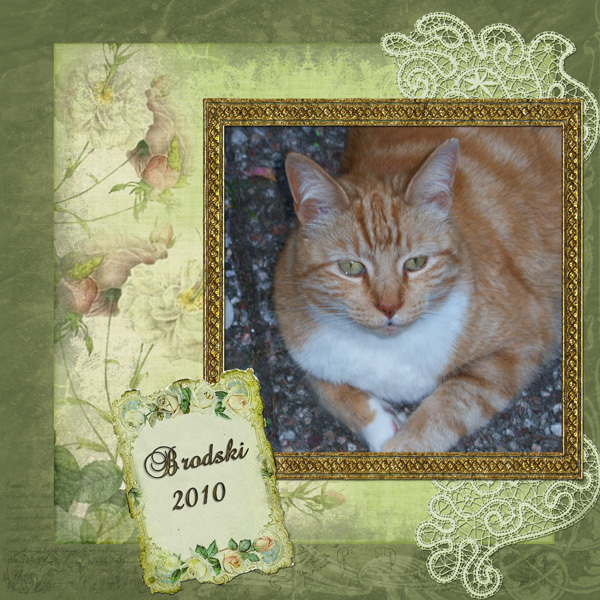 It was raining a lot, real autumn weather, with result that every now and then Brodski comes in to let us know he is still around, but mainly to dry up and then he goes outside again. Have you ever had the experience of a wet cat, that jumps full of energy and enthousiasm on the couch, where you sit nice and warm, with the only intention to rub his wet furr dry on you? NOT a pleasant thing. Most of the time it's only Brodski, but sometimes Dikkie Dik has the same idea, brrrrrrrrr. Yesterday evening it was really raining cats and dogs in double! And here it wasn't even the worst, as I saw on the news. Other parts of Holland had lots more of water in short time. It should be a bit better today, though there still is a lot of wind. Have to pick the right moment to go out for a little shopping. Let's hope I can keep it dry then! 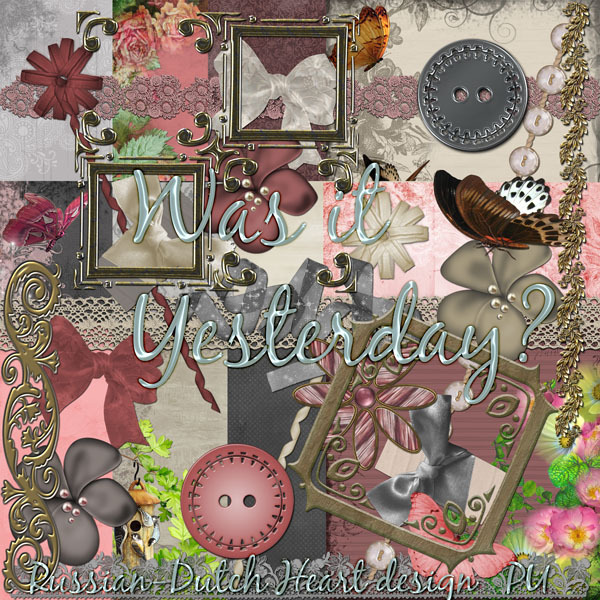 As this is about all to tell, we better skip to the freebie, a kit you can use for several topics, I guess, named "Was it Yesterday?". Hope you all had a nice weekend and charged yourself with new energy for this week. Weather here was a bit strange the last couple of days. But for a bright note, temperature was real nice! Only suddenly Saturday evening it started to rain, but I mean serious rain! And with it some lightning and even a few thunder blows. Thanks Mat, I really appreciate it. 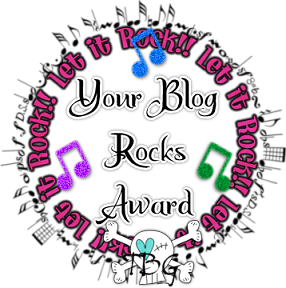 Now up to me to pass it on to 5 other blogs and of course let them know they can pick up this award on my blog and then they have to pass it on to 5 other blogs. Oh, Jan did an awesome find in the garden. He found a very little bat! The sad thing about it was, that it was a dead one. But I never knew they lived around our area! It was great to see it and in his own way he was quite cute too. And once in a while we still see our summer guest, the toads, around too. But you can notice that summer is almost at it's end, in the garden and in the streets and parcs. Leaves are falling, changing color, and though autumn has it's own charm, I am not hasty to welcome it yet. Yesterday we planned to go to town centre, there was the yearly market of the opening of the theatre season, then there are lots of stands with documentation of their programs and here and there also some little perfomances, mostly of music and cabaret. First we weren;t sure to go, weather was a bit cloudy, every now and then with a little drop of rain, but finally we did go(and we were right to do so, nice temperature, sometimes a ray of sun, and we catched just a couple of lost raindrops). This poor guy or girl had to walk in this stork costume all day, but I thought it looked funny. I liked this statue of Japanese fighter. This was was real nice. It was a stand to promote the city of Delft, very known buy it's porcelain fabric, the Delft Blue. Don't you think the dress is awsome? And here we had great fun to watch. I think it was around a stand for some kind of theatre program, but I just loved the policeman on his iron horse. The horse even made horse sounds! The guy perforamed a little show, at a point being very "annoyed"because his "horse" had dropped some stuff. And looks at his costume! They even didn;t forget the horses tail! Then walking towards the tram, we made alittle detour through a little park, whaere there are a lot of deer. They are just beautiful creatures, hey? We were home again about 4 o'clock, so time enough to give our poor feet a little rest and then I had an easy but tasteful dinner for us. I had an alreaydy roasted or grilled small chicken, which I warmed up in the oven, made a potatoe salad to it and then we had strawberries with cream. That all made our stomach full enough! Between all that I had some great time at the computer too, as I did all the "necessary house stuff"a bit on Friday and the laundry on Saturday morning LOL. 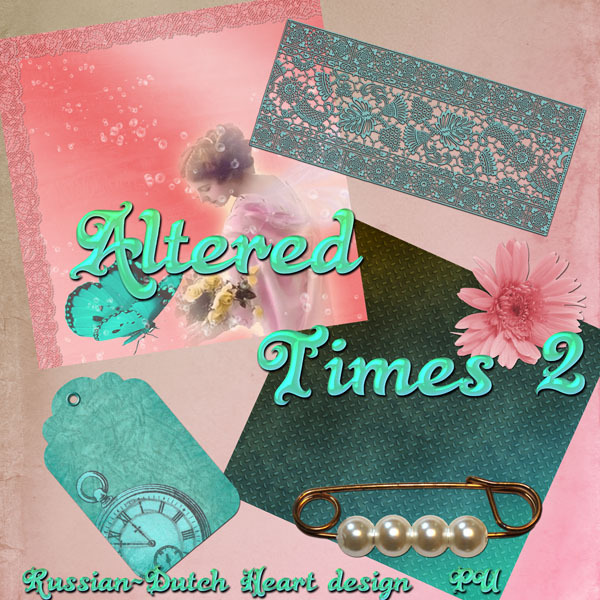 Made some nice stuff I think, some of it will be offered in seperate downloads, two very different kits that will be. 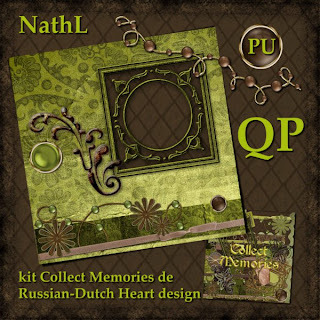 There a lots of elements in it, I hope you can make some nice layouts with this kit. The papers are made a bit like stacked papers. Here the preview and then downloadlink of the whole kit, named "Through Faerie Seasons"
Have a wonderful Monday and some great creative moments!! Cable TV, don;t talk me about it LOL! Starting the 1st of September our cable company, which provides us our tv channels, thought it might be nice to extend the offer. Well, nice thought, but suddenly we missed several channels! E.g. our Crime/detective channel. That was in an extra subscription we pay for, together with some Discovery channels, on top of the regular channels. I wasn;t happy about that, mind you, I payed extra for that and just like that, they remove it! Okay, yesterday morning I phoned the company, and asked the nice guy at the telephone an explanation. In short: they have 3 subscriptions now, TV z1m TV plus and TV extra. No more extra subscriptions for a bundle specials, like we had, they are now included in.................yes, you guessed well, in the PLUS (some of them) ad all in the EXTRA.!!! And of course our package was in the EXTRA now. And to keep it short, if we want our extra channels, it costs us a few Euros more, OF COURSE! This apart from the annusance that when they change channels, we also have to reprogram them on our tv( you can make your own "favourite list with channels you watch often which is handier, cause you can give them a channel number a bit more logical than the tv company does). I must say the guy at the telephone was very patient with me, explained it all very clear to me, no bad word about that. The end of it all is that we changed our subscription to the most extended offer, and hopefully this will stay a long time as it is now LOL! I asked the guy too, how long it should take to give us our extra channels back again on our tv and he answered that it shouldn't take more than 48 hours. Hmmmmm, I could live with that, but to my utmost pleasure already ysterday mid-evening we had them all again. What I mind most of those things is that they just change things as they please and at the end it always costs you some money! But okay, we have a lot of extra channels, and one of them might even be nice or interesting. It looks as if today we are going to have a real summerday! And tomorrow also, so perhaps we should enjoy that. Well, I already did about all the grocerie shopping that was necessary and also some housecleaning Wednesday and yesterday, just need to do a laundry. I have no idea what we shall do today, if we go somewhere or that we'll stay home, catching some sun in our garden. Difficult desicion ROFL! First of all I think I will take another cup of coffee and then we'll just see what today has in store for us. I have for you the 2nd part of the "Passage to India"kit. Have a mighty nice weekend, see you on Monday!